Perfect for the spring! This adorable Pink Polka Dot and Lace Dog Dress, has been one of our ALL Time Top Sellers in Lavender. BY POPULAR Demand, we've decided to bring this Top Favorite back, but only better. 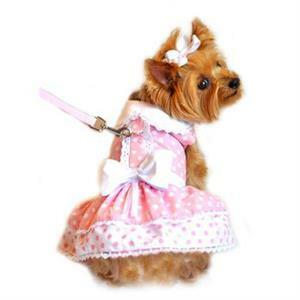 It now comes in Soft Pink, as a complete set with Leash and D-Ring. Made with Cotton/Poly Blend Fabric. Available in sizes Extra Small through Large. Please check size chart when ordering.